Here is another in our long line of egg cookbooks. 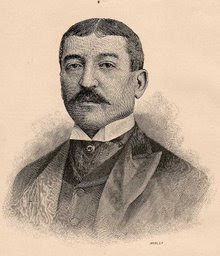 Alessandro Filippini, who worked for 25 years at Delmonico, wrote 100 Ways of Cooking Eggs. 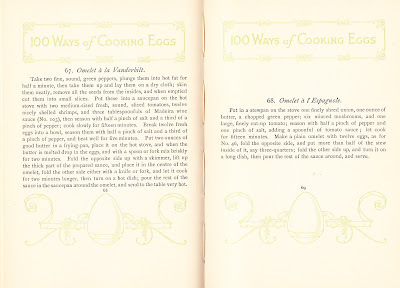 Originally compiled in 1892 100 Ways of Cooking Eggs was republished by the Dodge Publishing Company in 1915. This lovely period piece features a delicate, faint green decoration on each page that echos the cover with its beautifully “wrapped” egg. 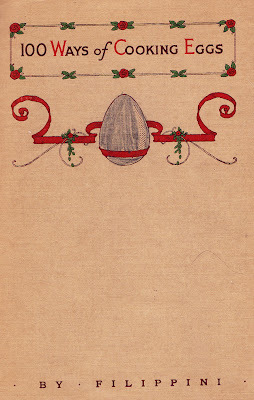 Having worked at Delmonico for a long period of time, Filippini saw his share of famous clients and many of them got egg on their name – or their name on eggs. 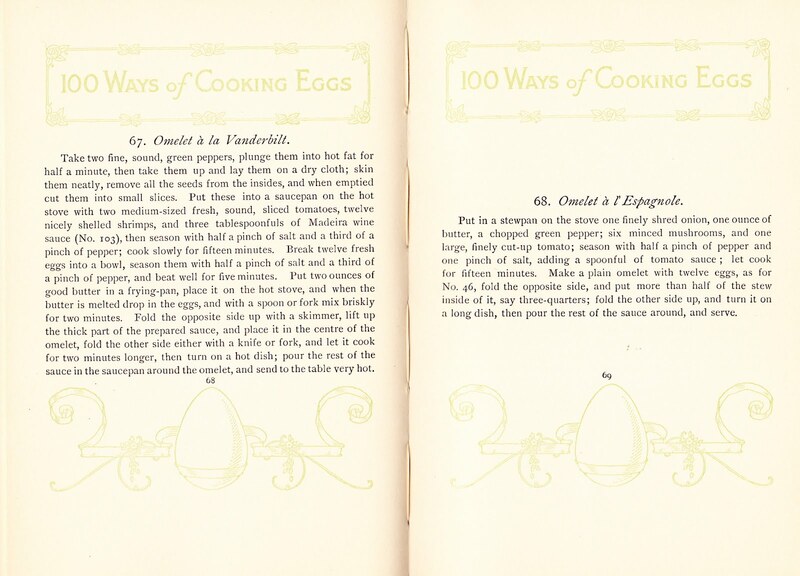 There are both eggs and an omlete Vanderbilt, both featuring a sauce of peppers. There are eggs Buckley, Hamilton Fish, W. W. Ladd, Jr., and Jay Gould to mention a few names that might stand out. Since this little book was written from restaurant recipes, they tend to call for a dozen-egg minimum. The omletes begin with a basic omelet and the variations are just things stuffed into them. There are the usual sausage, ham and tomatoes preparations as well as a few sweet egg concoctions. 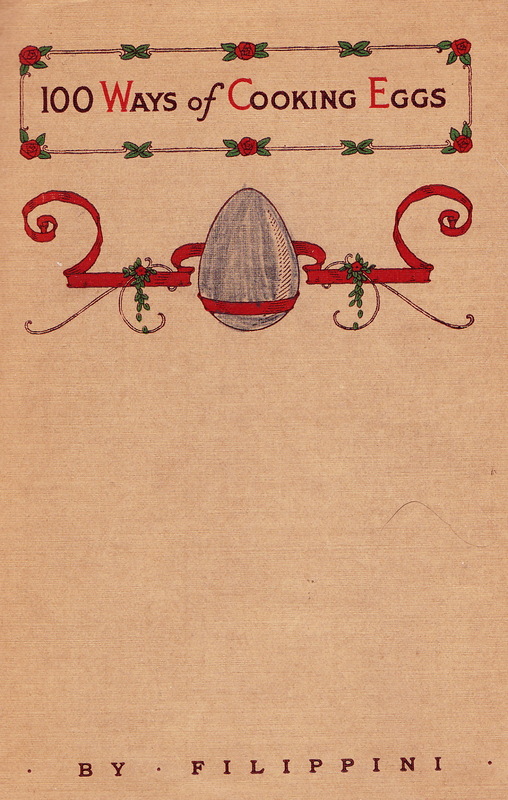 Put half a pint of cream into a dish, on the fire, and when it boils, break twelve fresh eggs, season with a pinch of salt and twelve whole peppers; let cook two minutes, and then set it in the oven for three minutes, so that the eggs get a good golden color, taking care that they do not harden. Remove form the oven, place the dish on another, and serve. Worth cracking some eggs over.